We keep trying to buy what director Terry Gilliam is selling. Sure, Tideland went by virtually unnoticed (though the film has its proponents) and The Brothers Grimm was a bit disappointing. We still keep remembering that this is the man who has brought us such classics as Monty Python and the Holy Grail, Brazil, Time Bandits, The Adventures of Baron Munchausen, The Fisher King and 12 Monkeys. There's a lot of brilliance in that man's mind, and even spectacularly failed projects like Don Quixote have shown all kinds of potential. His newest movie will be a curiosity for many because it is Heath Ledger's final role. Given what an unbelievable performance he gave as The Joker in The Dark Knight, that is understandable. 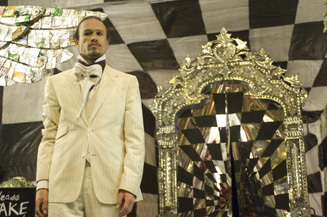 But the appeal of The Imaginarium of Doctor Parnassus goes even beyond Ledger's presence. It's the story of a man (The Doctor - no, not that one) who makes a deal with the devil and must then save his daughter from the terms he agreed to. He works alongside a traveling theater troupe and a mysterious outsider as they journey through parallel universes in an attempt to rescue the lovely Valentina. In the midst of filming, Ledger passed away, which caused Gilliam to come up with the ingenious story device of having his character change appearance at various points in the film. Tony, the mystery man, is also portrayed by Johnny Depp, Jude Law and Colin Farrell at various points, a novel and unique approach to the sorts of tragedies that constantly seem to beset Gilliam. Other cast members include Christopher Plummer, Verne Troyer, and Tom Waits as the Devil (perfect, right?). See the latest developments for this project on the The Imaginarium of Doctor Parnassus Movie News page.